A French couple, visiting their daughter in Manhattan, is sitting a few tables away. The daughter speaks about “les Amèricains qui mangent rapidement dans la rue.” It’s late afternoon and they order drinks as they would in a French café: une bièrre, un thé, un café. They are taking comfort in their own traditions, stealing a moment to sit and assess the day. “Ici, tout est la vitesse,” the daughter says. Maybe they’re right. Maybe any form of repose these days can be misconstrued as laziness in the minds of Americans, and even more particularly in minds whizzing away in New York City. Are we, as New Yorkers, becoming so used to the idea of instantaneous accessibility to information, products, people… that we now expect ourselves to operate as the machines upon which we have become so reliant? Have we lost self-grace? It sounded like a speed-metal version of Kubrick’s 2001 Space Odyssey and I didn’t like it. Moreover, I had to rush out of the restaurant, leaving the French behind, proving their opinion! Thanks, blond dude, for having your dog poop right in front of me while I eat. Thanks Barnes-n-Noble-customer-service man, who, like a strict homeroom manager, wouldn’t allow me to sit on the floor in certain places to check out a book. Thank you preteen for screaming “shut up!” at me for trying to keep you from throwing a U.S. postal box onto a moving car. Thanks Clothing Fairy, for taking my black sheath dress, designer sun glasses I got for Christmas, my black strapless bra and my little black gloves I got in an antique store in Oklahoma, and causing said items to literally vanish. So many conversations were swatting about me as I walked down the street, beating my head like bees. I needed out. Out! The only escape from the errant cacophony was a brief distraction near a vegetable stand in Union Square Market. 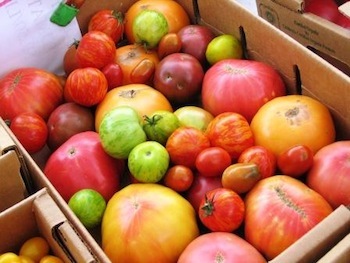 Heirloom tomatoes. Regardless of solstices and empirical calendars, this bright, odd-shaped fruit officially brings summer to New York. I actually smiled, letting my fingers pass over their shiny skin. I carried on through the crowds pacified—if at least for a moment—but I couldn’t ignore the fatigue. My jeans seemed to only magnify the humid warmth of the day. Someone eject me to France. Please??? One week later, memorial weekend arrived and along with it an invitation. 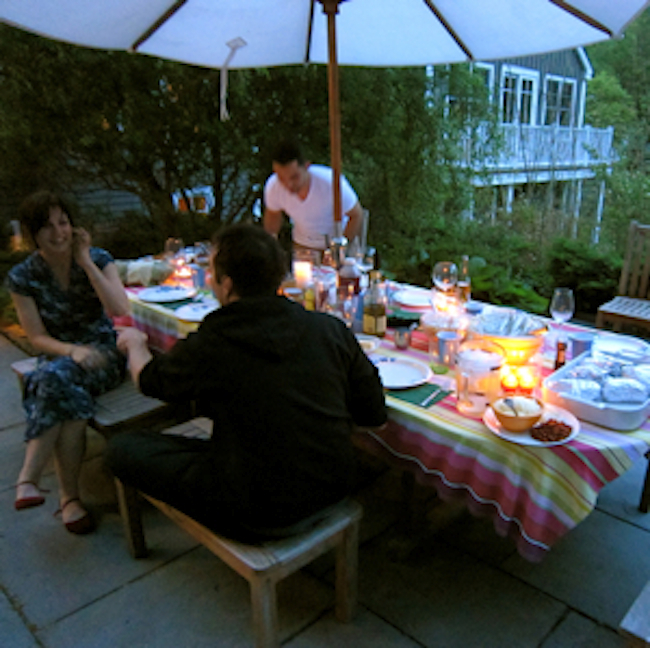 My fiancé and I were invited to join a few other couples to cook out and spend the night at their friend’s home just outside of Katonah, NY. Hal-le-lu-jah! My imagination sprouted the best movie poster ever: blue and black with bright yellow letters reading: Escape From Manhattan! (not the Kurt Russel version) Underneath the title would be men and women running for their lives from giant green Stress Monsters, holding clocks with jagged edges in one hand, and tax forms laced with cyanide in the other. I emailed my friend right away. Would it be possible for me to cook??? An email quickly sprang back. Of course! I felt blissful. It was the fastest bag I ever packed, and almost immediately upon arrival, I was all over the kitchen, baking potatoes, prepping meat for the grill. 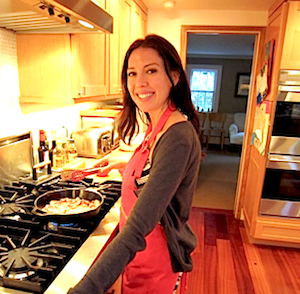 I wore a red apron that sang an ode to the goodness of butter, WHILE COOKING BACON! Could it get any better? I ate, laughed, and promised to give everyone my salad dressing recipe, and then I started to slow… Wind down… I walked about the large yard in the grass without shoes. I took a small nap on the couch next to the kitchen. A new friend covered me with a blanket and dimmed the lights. I dreamt that the day and evening could last longer, stretch like golden taffy. Such a generous blessing. The following morning, my fiancé and I napped happily on the train back to Grand Central Station. In brief moments of consciousness, I forgave the preteen, the Barnes-N-Noble guy and the man with the dog. They had probably reached “The Point” as well. (No excuses for the Clothing Fairy, but I let it go.) When we debarked, it was as if we returned to some sort of autopilot, moving back into the subways, back into the city, back into the beautiful strong diligence of Manhattan. We walked along at a snail’s pace, slowly, very very slowly into the station. I thought of the French family I witnessed in the restaurant talking about our vitesse. I wished I could tell them how we do it. It’s not a thorough disregard for a good meal, and it is not our disdain for repose, but a slight-of-hand brought on by the magical web of trains moving in and out of this island. These metal bullets are knights in shining armor, taking us to some form of restful glen to recharge ourselves. I was relieved to know: We, New Yorkers, have a sense of self-grace after all. “les Amèricains qui mangent rapidement dans la rue.” means: The Americans who eat quickly in the streets. “Ici, tout est la vitesse,” means: Here everything is speed. Roll lemons on counter to soften them. Cut the lemons in half and into a bowl squeeze in the juice. (2 med. lemons yields 4-6 tablespoons juice). Be mindful to prevent seeds from entering the bowl. I squeeze the lemon in my hand to catch the seeds. Add the vinegar and salt. While quickly whisking, begin slowly drizzling in the olive oil. As you whisk the mixture, it will become thick. Taste. If the lemons are not very tangy, you may need to add more juice, but if the flavor is very lemony but lacks acidity, add more apple cider vinegar. Add dressing to your salad, mix well, add freshly grated black pepper and serve. Preheat your oven to 375 degrees F. Wash the potatoes thoroughly and remove all knots or spots with a small paring knife. Dry potatoes well. With a fork, stab the potatoes all over vigorously. Don’t be shy. Place the potatoes in a bowl or large baking dish, pour in olive oil to coat potatoes. Use your hands to make sure the potatoes are coated. Now salt the exterior of the potatoes. Again massaging this mixture with your hands. This will flavor the skin, and keep the potatoes from becoming too chewy. When they are good and coated, wrap each potato in foil. Place all four wrapped potatoes in a large baking dish. Place potatoes in oven. Fill a small separate baking dish with water. Place this dish also in the oven. This creates steam and bakes the potatoes more quickly. Bake potatoes for one hour in a 375 degree F oven, or 45 minutes in the oven, and then 20 – 30 minutes on the grill. Serve with any topping you like. I like homemade bacon bits, onions and cheese. Enjoy!